If there’s one word that distinguishes pediatrics from other specialties, that word is growth. This month we’ll focus on the importance of the growth curve when following infants, children and adolescents. The charts that we have linked to on the following page were published by the Centre for Disease Control and Prevention (CDC) and contain data sets from five national surveys (1963-1994), based on the population of the United States. The data sets are cross sectional samples based on chronological age. Low birth weight children were excluded. The latest data from 0-6 year olds has not yet been incorporated, and thus may not take into account the wave of obesity we are seeing in the U.S. and other countries. Curves charting the body mass index (BMI) for age can be found on the reverse side of the newest CDC charts and are helpful for plotting those kids who are overweight or obese. The revised charts don’t necessarily represent optimal growth in infancy as the population data sets represent periods when most babies were bottle- fed; since 1970, only about 50% of infants were breastfed and of these merely 30% for greater than three months. What’s important to remember is that exclusively breastfed babies will plot higher for their weight in the first 6 months and lower for weight in the 6-12 month period. So they may appear to ‘fall off’ their curve. One other disadvantage is that the CDC curves represent cross-sectional data sets based on chronological age and not pubertal stage, and therefore don’t take into account the pubertal growth spurt (Nelson Textbook of Pediatrics, Kliegman, Behrman, Jenson and Stanto, 18th edition, Chapter 14, Assessment of Growth). The World Health Organization (WHO) has a working body — Multicentre Growth Reference Study (MGRS) — that has developed new growth curves. This group is looking at the growth of children brought up under optimal circumstances, e.g. exclusively on breast milk. The study sites include diverse countries on five continents: the U.S., Brazil, Norway, Ghana, Oman and India. The WHO curves are available as downloadable software for your computer at www.who.int/childgrowth/standards/en. The CDC curves can be downloaded for your PDA at www.statcoder.com. The latter program provides you with weight, height and head circumference for age, as well as blood pressure norms. There are also a variety of computer and PDA programs available for calculating the BMI. Growth curves are available for different ethnic groups, children with Down’s and Turner’s syndromes and achondroplasia; these latter can easily be obtained by “googling” the curve you want. Regardless of which curves you use, their power in following the health of an individual child lies in religiously plotting the height, weight and head circumference at all well-child visits. The growth curve is a very sensitive indication of a youngster’s overall health. Ideally, the head circumference should be measured with a rigid tape above the supraorbital ridge, parallel to the ground, and encompassing the largest circumference of the head. Accurate weight measurements are usually easier to take than length or height. 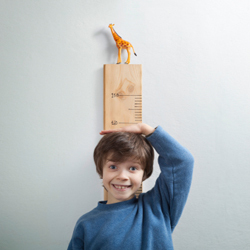 For kids under two years old, length is obtained with the child lying; over age two, the height is obtained with the child standing. For infants, a rigid device with a movable foot piece should be used. I suggest a stadiometer as the instrument of choice for those over two. Ideally, the same person should make the anthropomorphic measurements at each visit to avoid interobserver variability as much as possible. Exclusively breastfed babies will plot higher for their weight in the first 6 months and lower for weight in the 6-12 month period.